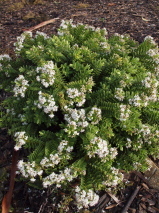 Compact, spreading shrub with stout often decumbant branches. Fresh green spear shaped leaves are almost overlapping, and give this dense shrub a very attractive appearance. The white flowers with prominent purple stamens, appear in spring and summer. 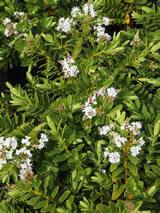 It will grow in sun or semi-shade, best in well drained soil that does not get too dry. Hardy to cold. Jack Hobbs raised this Hebe cultivar at the Auckland Regional Botanic Gardens.